Get it... Because Lunatic is a synonym for maniac, and Luna is dressed as the Mane-iac! I know it is a little early to be posting a Halloween picture, but I made this for my upcoming vendor table at Nightmare Nights Dallas. My Little Pony: Friendship is Magic© and its Characters both belong to Hasbro©. I don't know if I was the first person to make Luna dressed as the Maniac, but I came up with the idea and design on my own. I like it much more than the original. Nice Nightmare Night costume you have, Princess Luna. AND REALLY? LUNA-TIC!!?? I LIKE THAT!!! HAHAHAHAHAHAHAHAHAHA! Ha. Ha So. Very. Funny. Luna-tic. This is really freaking awesome!! Looks great! Love the idea. Bonus etymology points. Do you know why "lunatic" is synonymous with "maniac?" Because mania is an actual mental disorder marked by periods of euphoria, impulsiveness and general lack of self-restraint. And there has long been a widely perpetuated myth that the full moon increases the madness of mentally ill individuals - giving rise to the term "lunatic," which literally means "moonstruck." : Behold! Thy mighty princess is dressed for Nightmare Night as the Mane-iac! 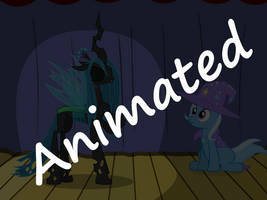 Nay, Derpy in her paper bag ensemble is not the only maniac in Ponyville this enchanted night! Cute artwork! It shows off Luna's playful side! : "Sorry, Rainbow Dash... mmf... mmm nom nom... Um biffy erpin diff biff yummy... nom nom nom... purmpkin muffin!" This is great, Luna really would make a good Mane-iac. Love the pun, too! It fits so well! "I put a lot of effort into that costume, you lot had BETTER appreciate it." Behold the madness!!! Behold the Luna-tic!!! Good thing that Luna is no lunatic... Or maybe I'm wrong... I hope I'm wrong. Suits her great! But it's only the ponies who read the Power Ponies comic who will know who she is. "Maybe among the kind of crowd our nephew-in-law was with in high school..."
"Hey, this was HER idea, not mine! "